The largest environmental trade show in North America lived up to the hype in February, when the Pumper and Cleaner International Environmental Expo opened in Indianapolis, Ind. The Municipal Account Executives Ashley Adamaitis and Chris Smith were there and had the pleasure of meeting both current and potential municipal suppliers. While the wooly winter weather we’ve all battled this year whittled down the outdoor demonstrations and displays of equipment, inside the Indiana Convention Center the exposition floor saw heavy traffic. From Monday, Feb. 24, through Thursday, Feb. 27, thousands of clients and crews browsed water recovery, electric control, trailer, treatment system and other product exhibits, and worked on continuing education credits. They even had some fun, like when the GapVax chopper showed up on Wednesday. 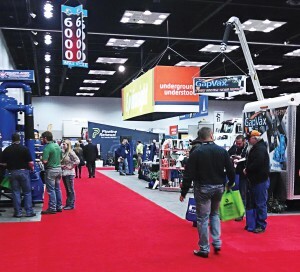 Another round of Pumper Cleaner International Environmental Expo will take place next year, also in Indianapolis. If we didn’t see you in February, please don’t hesitate to give us a call between now and then!